I just wanted to post a quick note to say that I have made the design team for Sketches! By Tamara! I am very excited to be part of a sketch team and share with you all some great layouts! Head on over to her blog for some fun inspiration and I will have a creation to share with you all later. Today is the first day of Kindergarten for my twins! Well, couldn't we all just benefit from a break? 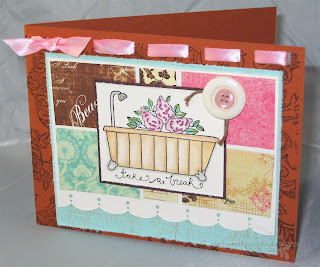 This stamp says it all with a tub and flowers and mentioning to take a break. The image is from MFT and the line of MFT Presents... I decided to pull out my neglected Koh-I-Noor colored pencils and odorless mineral spirits from Gina K. I just love how these pencils blend! For the bg I cut up some sample sheets I picked up from CHA at the Webster's Pages booth. They were bookmark size sheets with sample collections of their line. I thought it would be fun to collage them somehow. I stamped the main card with SU! new bg stamp called Bella Toile. So pretty! I then used Tim Holtz' distress inks on the Papertrey Aqua Mist cs while using a Martha Stewart border punch on the main panel. I distressed all the panels and used a ribbon punch for the holes to thread the ribbon at the top. I added a button and some twine and some stickles to the shower head for a little sparkle. Lastly, I added some pink Copic Spica, which you can find at MFT, to the flowers in the tub. In the end, it kind of took on a shabby chic look... I think. : ) Thanks for stopping by! It happened! Mark the day! I have finished my stamp room and had a moment to create a card!! I have all these fabulous MFT sets that have been screaming for some ink! This set is called Monster Squad. Isn't it just the cutest??? 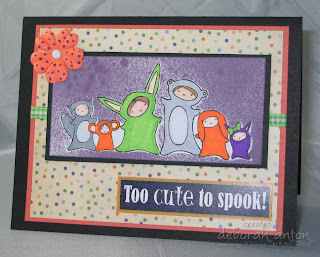 I also used some Halloween stickers that Kim was giving away- I saw the 'Too Cute to Spook' and immediately pulled this stamp set out. I thought it was pretty fitting. I stamped the image and then masked it so that I could spray some Glimmer Mist on the bg. I then outlined it in black, although you can't really tell. I used some DCWV fall mat pack paper I had and used my purple Prismacolor marker to make the Prima flower polka dotted. The image was colored in using Copics and Prismamarkers and is popped up on diamensionals. I added some ribbon and it was done. Thanks so much for stopping by as I will have more to share today! I have to survive 4 more days until school begins for my boys. They are starting kindergarten this year and I can't help remember what my MIL said about how I will be crying on that day. (Hi mom!) I also can't help remembering me saying to her that I really won't; perhaps the car will still be moving as I say good bye and tell them to jump out. (of course I am joking here...we will be walking to school) It is days like today that I am certain I will kiss my boys good bye, tell them to have a great day, all whilst I RUN home to enjoy the peace and quiet and maybe stare at the wall- and pour myself a mimosa! What do you think? Do these pictures say I am right or is it like an 'Alexander and the Terrible, Horrible, No Good, Very Bad Day?' What is it that you are looking at? Well, you know those thick foam protectors you get in a box of something new? Yeeeaaahhhh... well they took those and thought our house needed to be cushioned much like one of those squishy pillows filled with mini foam circles! OH! You have to click on the picture to get the full effect of my pain... ok, maybe not, but my vacuum is on overload! So, Carolyn, I am with you when you say why you don't home school and ready for school to start! It is all under the bed, in those tubs, the closets, my office, my bedroom, the living room, and even in the laundry room! 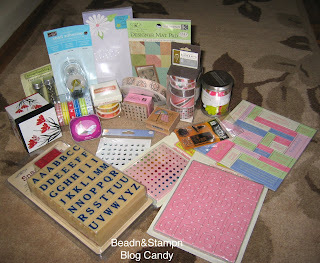 It's time for some BLOG CANDY!!!! 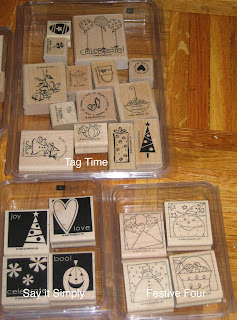 In my, what seems like ENDLESS, organization and unpacking of my stamp room, (ok, it's really not that bad... just lack of storage in this new place...) I have found lots of things that I had been saving for Blog candy. I tend to pick up things on my excursions to different LSS or big names and I stash them for some fun candy. Because I have lack of storage and have to share my space as a guest room, I am compiling most of what I have saved into one big candy giveaway! All you have to do is leave me a comment about how you like to store your embellishments that saves on space and/or your 12x12 paper. I would love to hear all the different ideas that I may have to incorporate into my space! I also want to continue my thanks to you all for your patience in not sharing any creations. I am almost there!!! There is some light shining through... This giveaway will run until September 1 when a random winner will be picked via DH.com. So, spread the word and good luck to you all!! Below is a picture of what will be given away! Even a set of Karen Foster's SNAP STAMPS are included!! Karen Foster Snap Stamps, American craft ribbon, misc. ribbon, embellishments, Studio G Alphabet stamps, Halloween stamps, and summer stamp, Hobby Girl mints, Greenhouse plastic flowers, K&CO mat pack, Chipboard letters, rhinestones, piercing template (circle), SU! 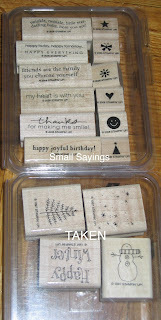 Snail tape refill, trinket box for altering, metal dots embellishments, chipboard sayings from CTMH, and memo pad. ENJOY! Wow!! I never really realized how much stuff I have acquired in this "little" hobby of mine, but it has grown to be more than I can use. Or just used and probably won't use again! SO! With that said, I have some SU! 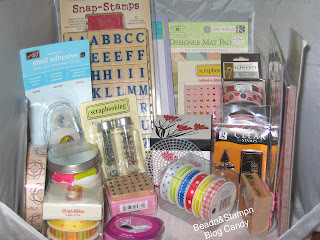 and Angel Company stamp sets that I am GIVING AWAY!!! All you have to do is pay for Priority shipping!! It is definitely a bargain... if you see one you want, email me. I accept Paypal only for these and once payment is received, I will send it out in the mail. I will only hold what you want for ONE DAY and then it will be up for grabs after that. I am looking to just deplete these items, so pass the word along to anyone you think may be in search for any of these. These sets have all been loved and taken care of, so none are in bad shape. I am not completely sure of the sentiment set names, but I will describe them the best I can. I am hoping to be back in commission within the next few days... I know, I have been saying that, but I keep running into more things to do!! : ) But really, I will have something up REALLY SOON!!! AND... I will have some serious blog candy tomorrow!! Thanks as always for stopping by!! I am finally seeing some light at the end of the tunnel!!! Boxes have surrounded me the last week and a half, but most has been unpacked. I made a promise to dh that I would not unpack my office/stamping room until the rest of the house was done. I think that was only fair. It is important to ensure the kids are settled and that we have a "home" to surround us. Paper and ink had to take a back seat. We did paint the living and dining room this past weekend and we are so happy that is done. It has made our home that much more cozy! Speaking of the kids, they have adjust to this move quite nicely with no hiccups. We were not sure what we may have been in for, but once again, they have surprised us by being so excited about being in a new place. They are ready for school to start (so am I!!) and they are excited about being able to walk to school. Their school is around the corner and its great to know that it will serve two purposed for me- drop the kids at school and get in some morning exercise. 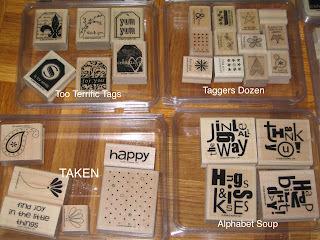 I hope to have my stamping room finished by this weekend as I need dh to help move some desks around. So, perhaps a creation??!! I sure hope so! Thank you all once again for being so patient with me during this transition. There is so much I want to share with you! ** Don't forget... MFT is having their release party tonight from 9-11 PM HERE! Come join the fun and see all the new and exciting releases they have in store!! PLUS, Kim is giving away some free stuff for the first 50 orders! Did I mention FREE??! !